Picture the scene: the sun was shining, the eldest was at school, and my husband and I were at home with our soon-to-be-two little boy. 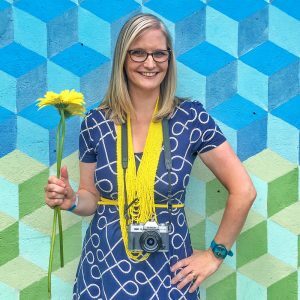 Regular readers of the blog will know that I’m a firm believer in ‘little adventures’: I love to plot day trips to beaches, castles, beautiful towns… anywhere to inspire the mind and lift the soul. 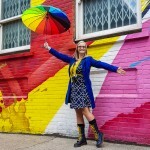 (Especially if there is a photo opportunity in it for me!) 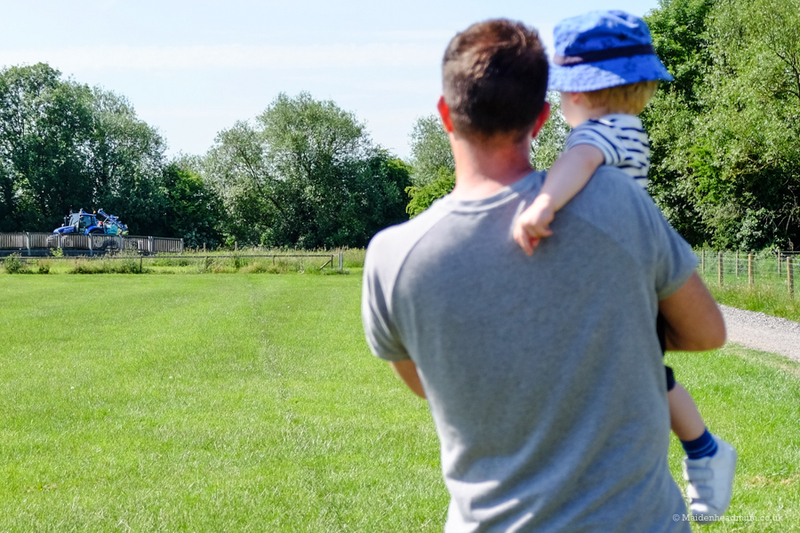 With only one small human to look after, and away from the constant questions of a five-year-old, we decided this was a great opportunity for us to get out and explore parts of Maidenhead that we’d never been. 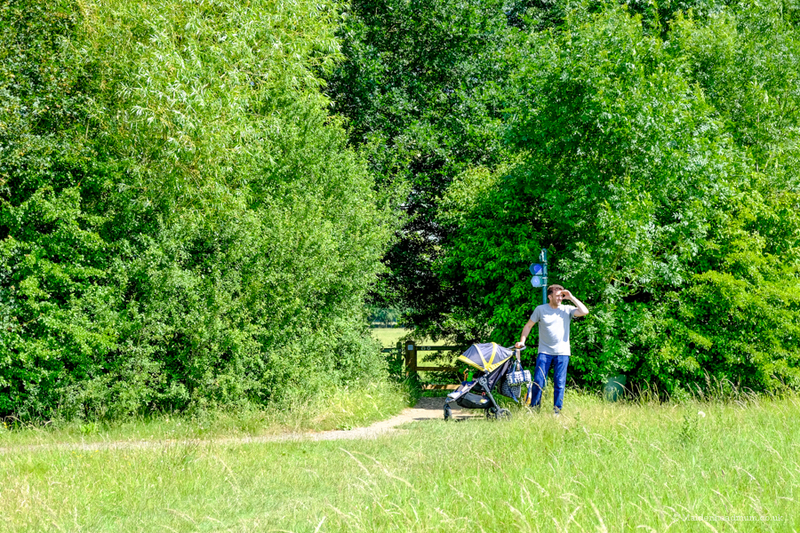 I’d recently heard about The Green Way, a public footpath that runs from Bray, through Maidenhead and then up to Cookham and having read that it was buggy friendly, I figured that we could take the toddler along so he could get a change of scene and experience some of the countryside around us. 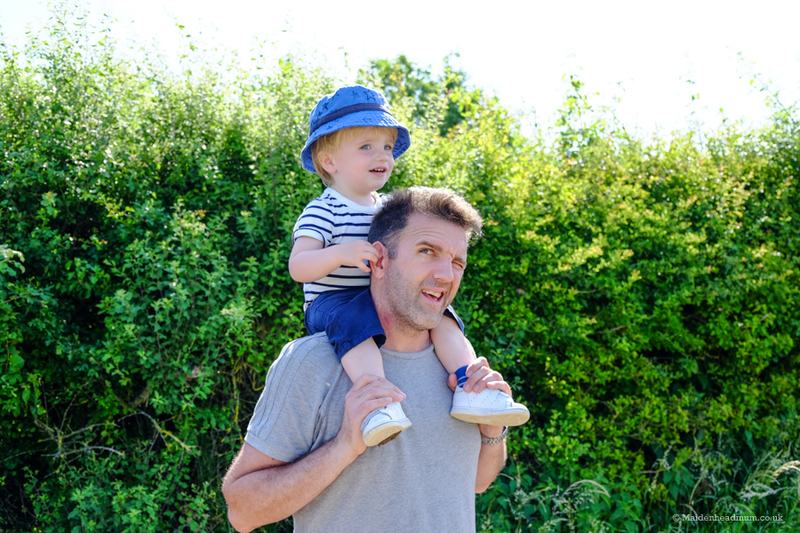 The path is flat and accessible with a buggy or bike… although who wouldn’t want to go on Daddy’s shoulders if they could?! Houses opposite North Town Moor. 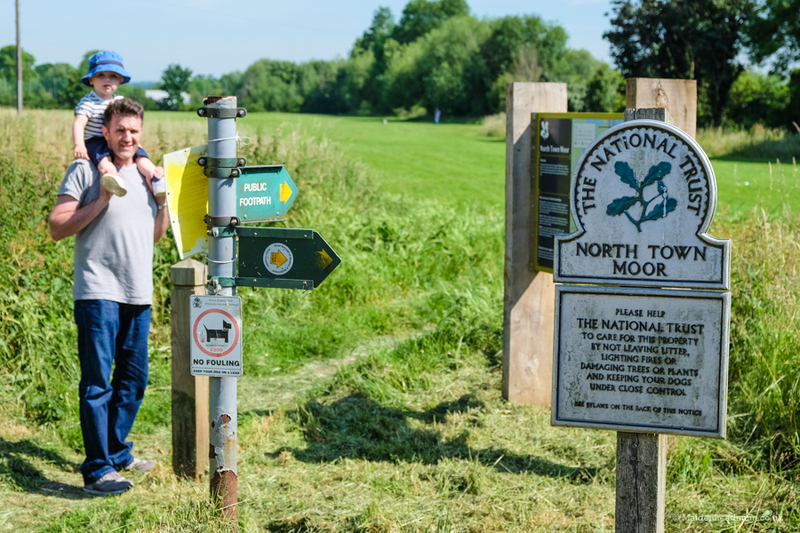 We chose to start our route at North Town Moor, just off North Town Road. 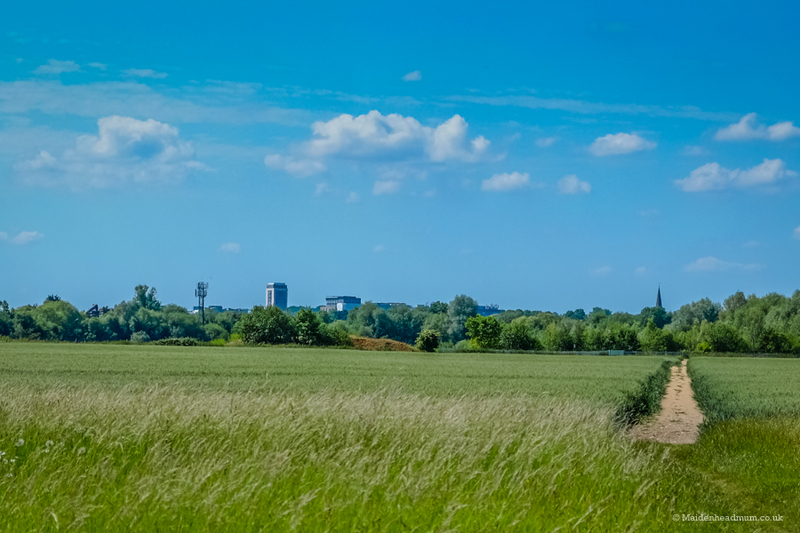 I have to confess that we lived just around the corner from here when I first moved to Maidenhead in 2010, but I’ve only really explored a small part of the moor. I hadn’t really researched much further to see where the footpaths lead. We decided to start our walk here as there is a small car park at North Town Moor. This was fine on a quiet Wednesday morning, but I can imagine it could get much busier at weekends. North Town Moor is owned by The National Trust. You can download this map from the RBWM website, details at the end of this post. 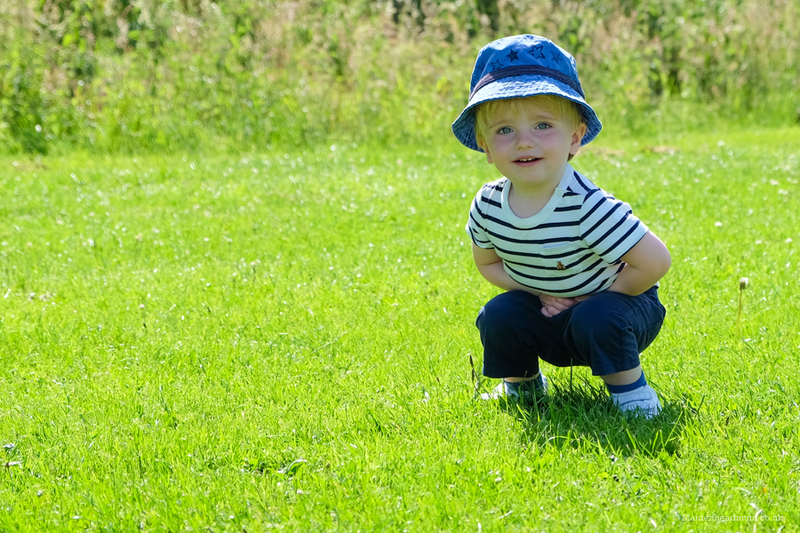 This cheeky Little Man began by running around in circles! Not quite the start to the walk we had hoped for. In the buggy… out of the buggy. The joys of an indecisive toddler. Finally happy on Daddy’s shoulders. As long as he could poke daddy in the ear with his finger! Ah, the perks of parenthood. There goes Old Macdonald! Love a distraction when you’re in the middle of toddler ‘negotiations’! 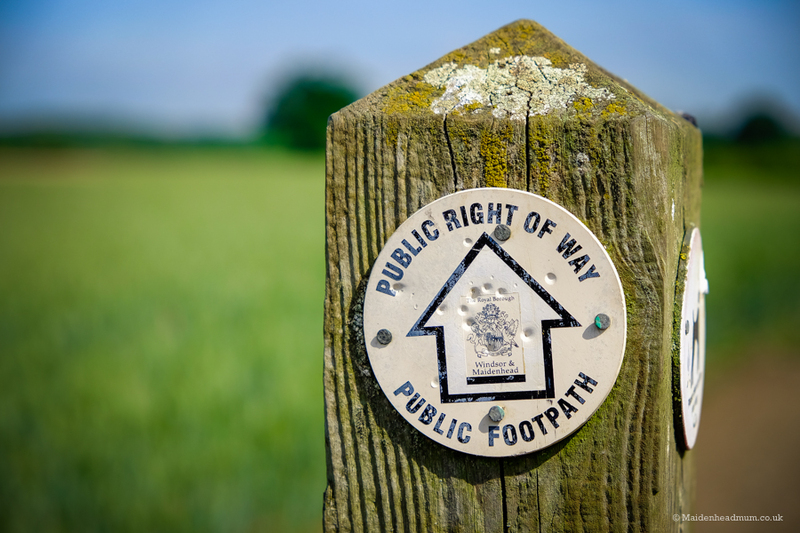 The footpath is well signposted, although I had downloaded a PDF on my phone for reference, too. We chose to walk across the moor and then take the ‘Green Way East’ route up towards Widbrook Common and then back along Maidenhead Ditch (the romance!). 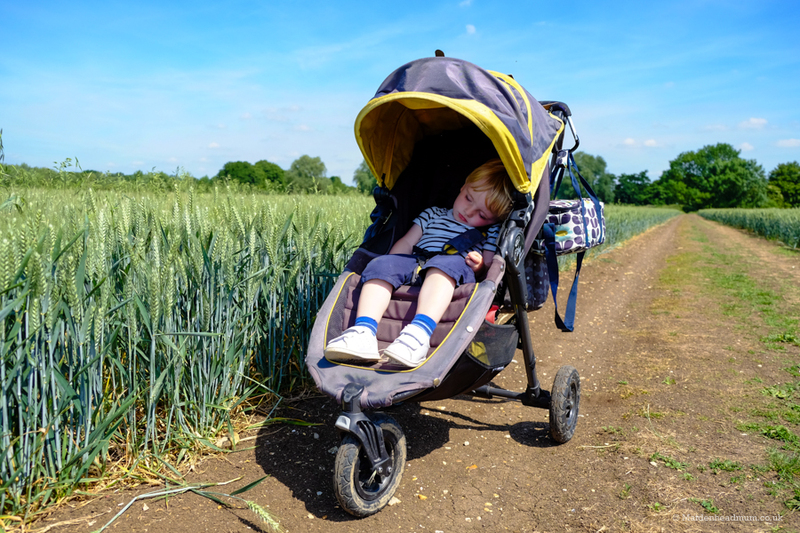 There is an extra loop at the top of the route that takes you right up to Cookham but we didn’t think we’d manage to get all of that done in a morning and we are still religiously sticking to the lunchtime nap at home for the Little Man. 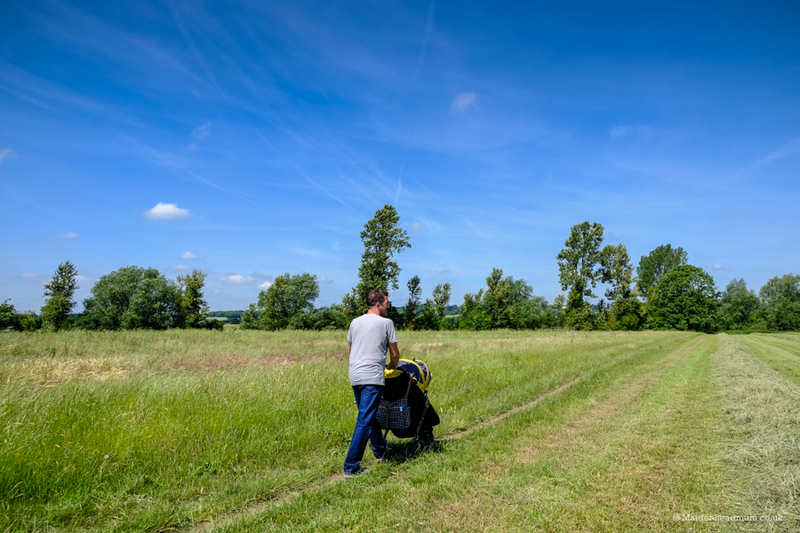 Having a circular route was also much easier for us to figure out with the buggy. One day, when I’m child free, I’d quite like to walk from North Town Moor down to Bray to get my head around how it all fits together when you’re away from the busy main roads. Open fields, blue skies and a sleeping baby. Lush. There isnt much shade along the way so remember to pack sunscreen, water, shades and a hat. What can you see on The Green Way? 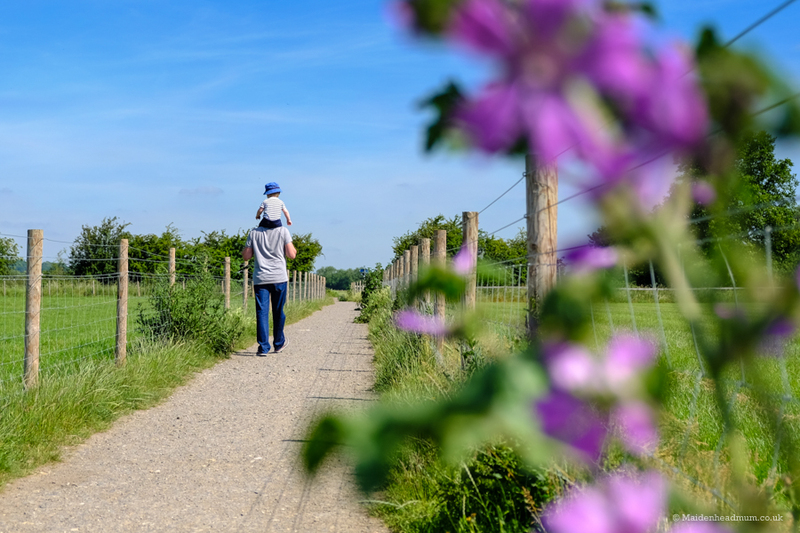 The path goes via farm fields, hedgerows, ponds and streams and the air is buzzing with bright damselflies and butterflies. You can probably see lots of birds too, although I didn’t really keep an eye out when we were walking. 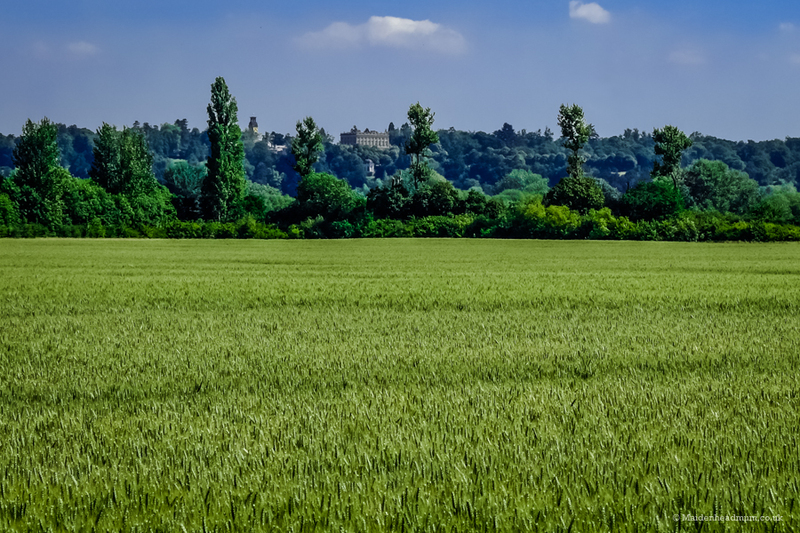 I was intrigued to see Maidenhead’s skyline with Berkshire house peeping up above the fields, and also Cliveden house on the distant hillside. It felt completely timeless and almost like we’d stepped into a magical bubble away from the pressures of everyday life. Over in the distance, you can see Cliveden House on the hillside. I loved seeing flashes of colour from the wild flowers. 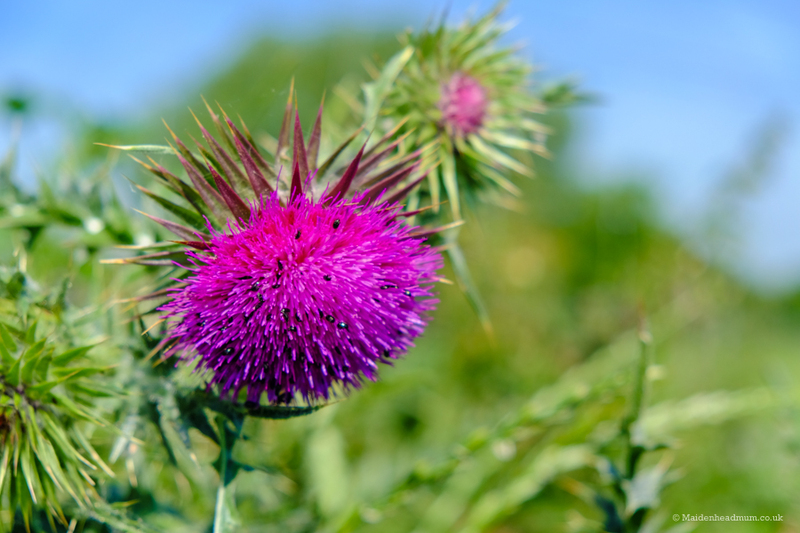 I have now learned that this is Burdock. 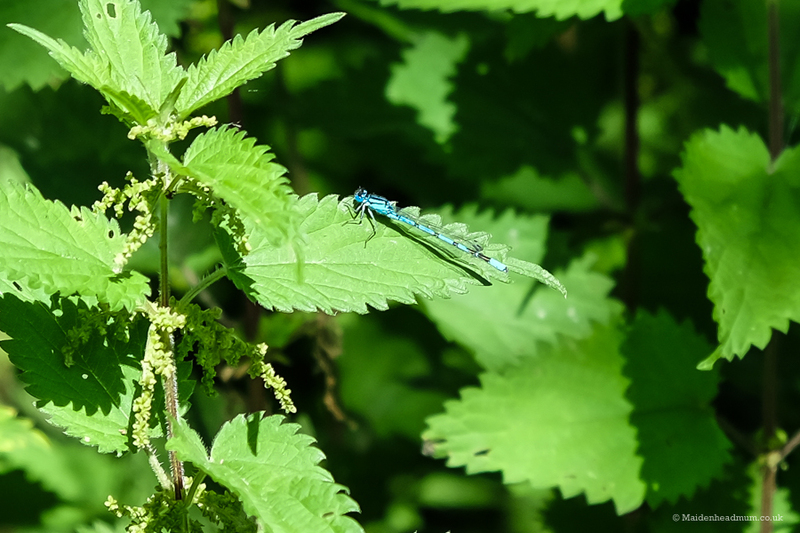 These electric blue Damselflies were zipping around us as we walked. 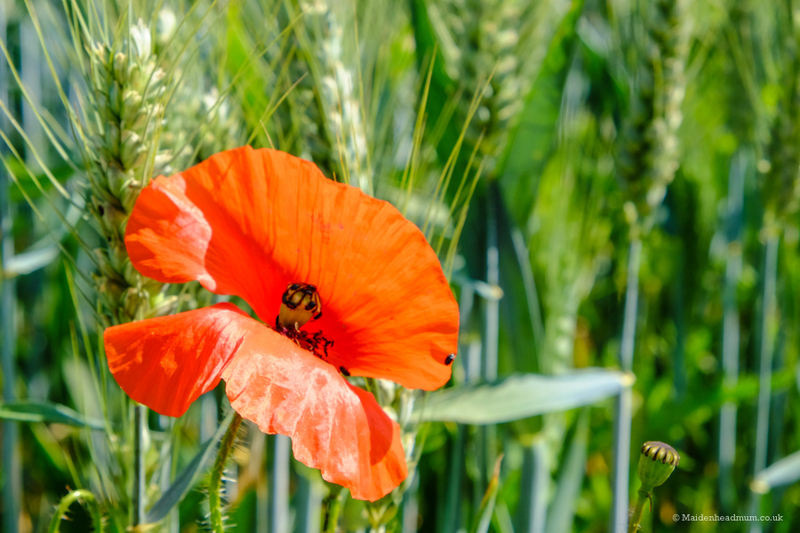 Wild poppies are such a gorgeous colour. There were just a few peeping out at the beginning of June when we went. 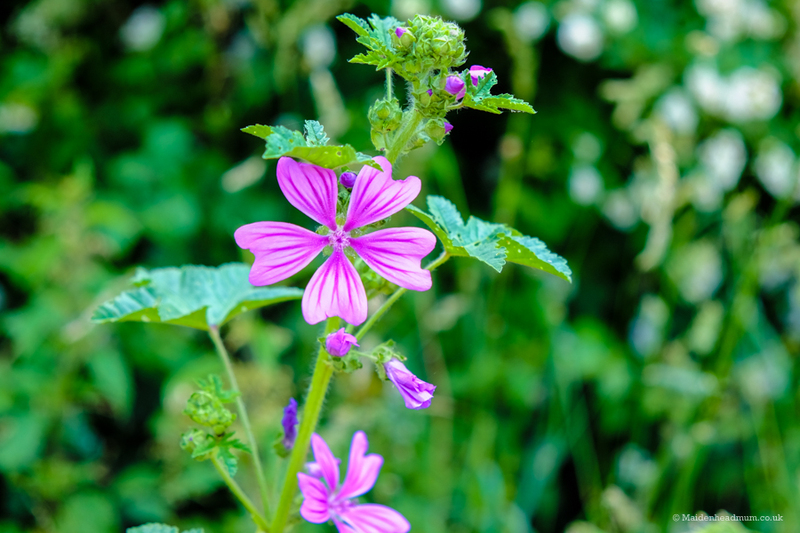 I’ve seen these pretty purple flowers (‘Common Mallow’ all over Maidenhead. 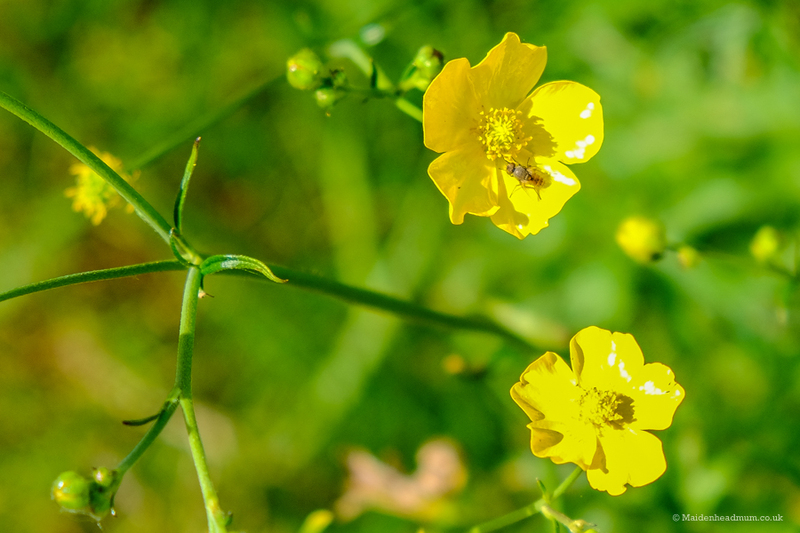 If you have a camera with a zoom lens you can get some great close up shots of the flora and fauna as you walk along The Green Way. 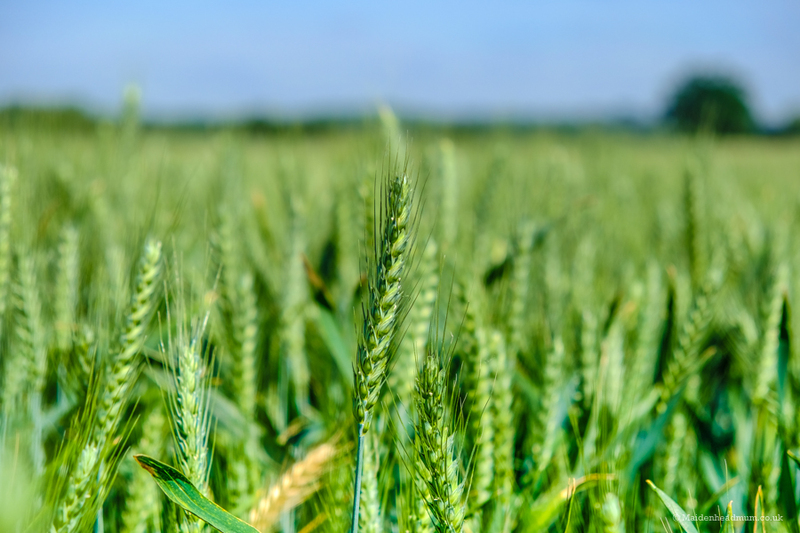 Maidenhead ‘skyline’. I wonder how different this will look in a few years time? 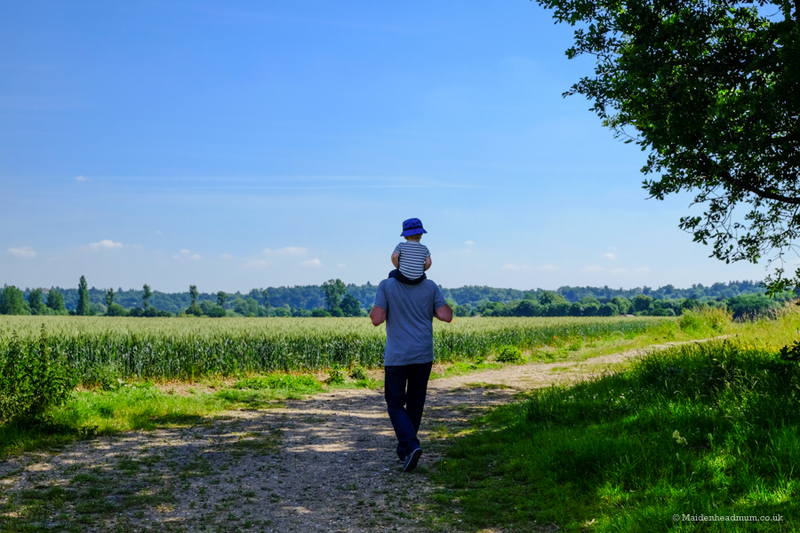 My son’s excitement peaked pretty early as we walked through cornfields and he explored the pathways, picking up stones along the way. 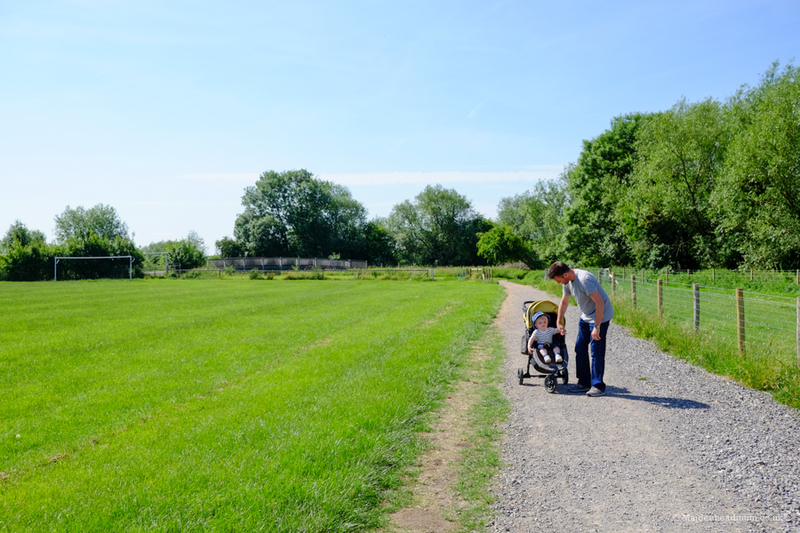 Within ten minutes he had passed out in the buggy leaving my husband and I to chat freely as we walked along the route. Our sentences are normally interrupted by ‘Mummy…’ and ‘Daddy…’ before we even finish them so this felt like an unexpected treat. Following Daddy… but being distracted by stones. He LOVES to pick up stones and collect them! Takes us ages to get anywhere sometimes! 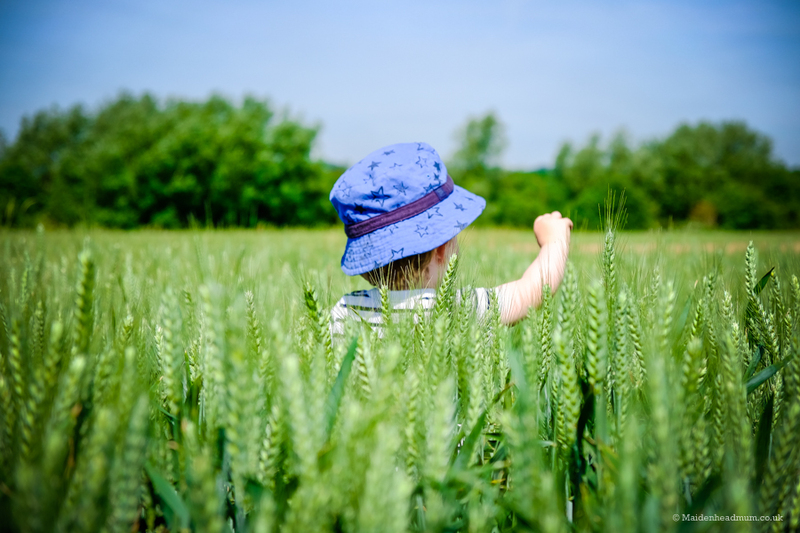 There were paths in between the corn rows which were fun to explore as the corn was nearly as tall as my son. Shapes and textures to inspire a tiny mind! 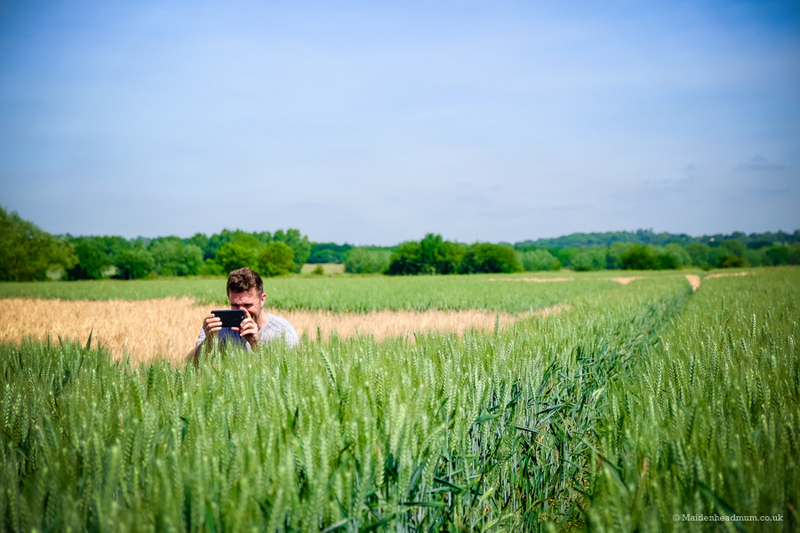 Seeing my husband crouching in the corn tractor tracks to get the ‘best shot’ is a little reminder of why I love him. Obviously, I was doing exactly the same thing. What must we have looked like?! Who will like The Green Way? 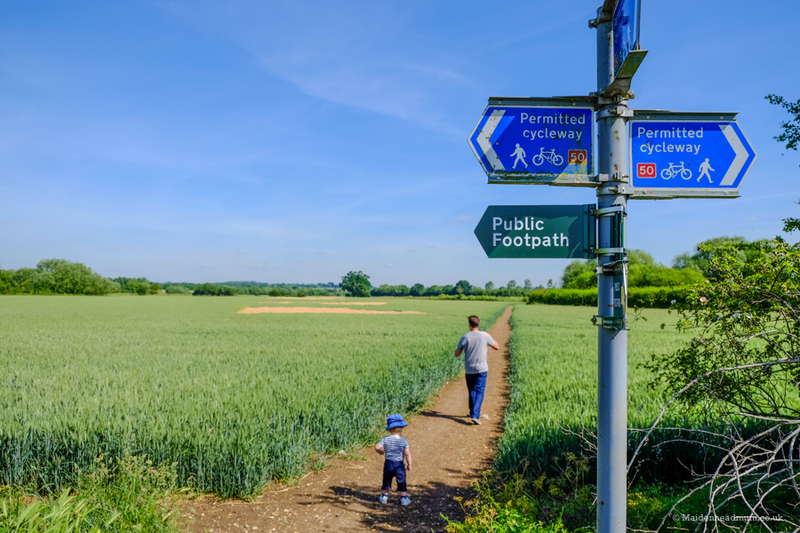 In the future, when we all have bikes, this will be a lovely route across the fields and over to Cookham for a picnic. The paths through the fields can get a bit bumpy (and muddy in wet weather) though, so it’s not ideal for scooters or ‘beginner’ bike riders. 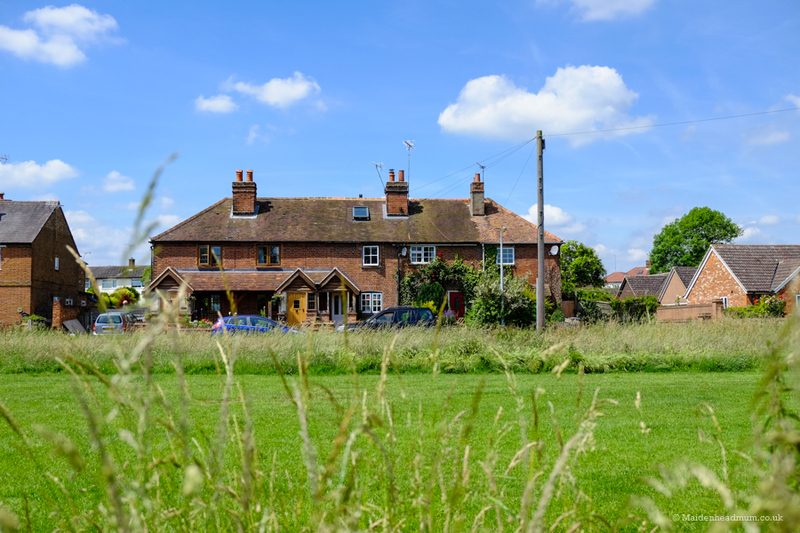 If you don’t fancy doing a circular route, you could walk to Cookham and then catch the train back to Maidenhead, or even catch the train one stop to Furze Platt if you wanted to break up the walk a little bit. I think this would definitely get my two years old’s attention! Lots of greenery along The Green Way. It was all a bit much for a certain little person! I’m not really a ‘flowery’ person and I’m usually most at home swooning over architecture in the city, but something about this walk was really inspiring. I think it was that if you tuned into your surroundings there were flashes of colour and contrasting textures everywhere. I found that I couldn’t stop taking photos! 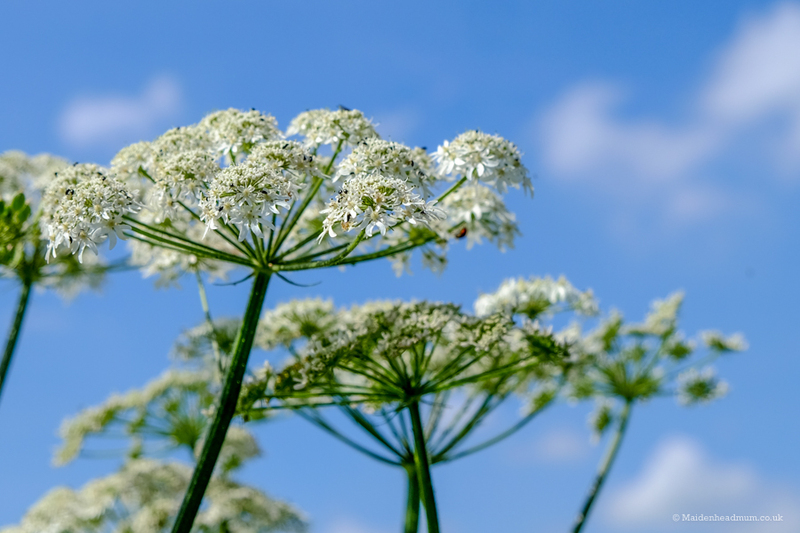 Hogweed contrasted against the bright blue sky. 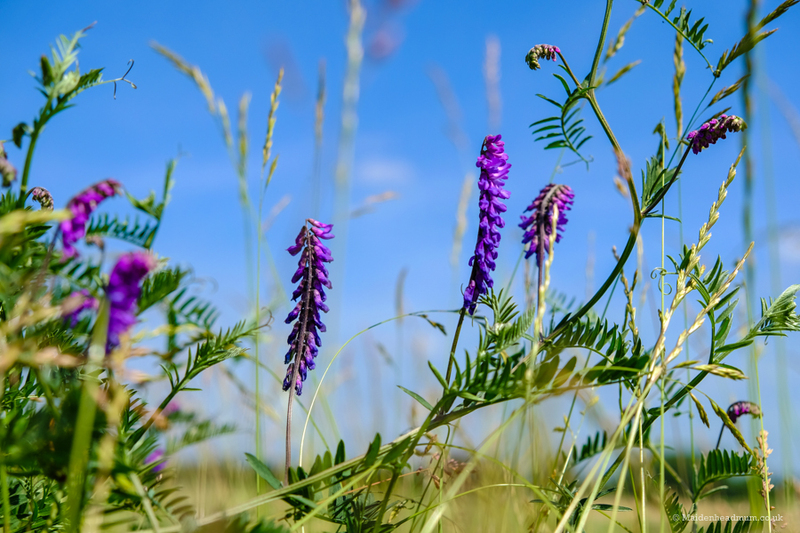 I’m reliably informed that this is called ‘Tufted Vetch’. 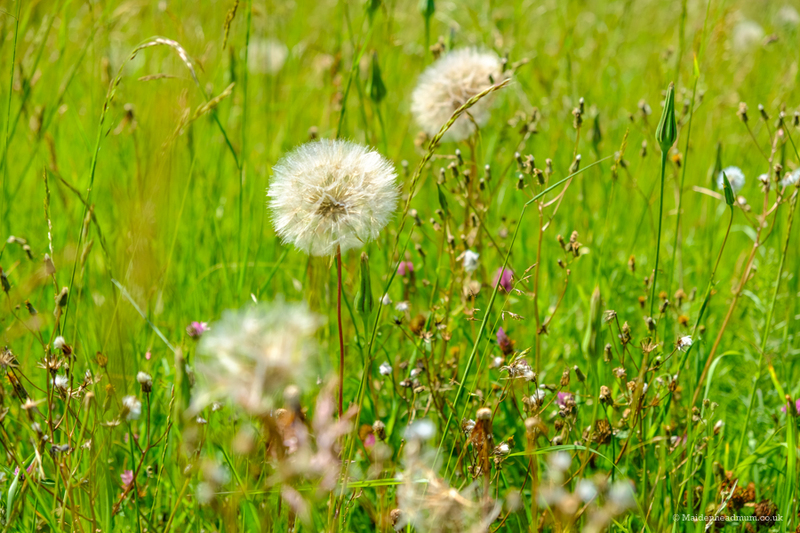 ‘Goat’s beard’ seed heads. My daughter would have wanted to blow these away immediately! 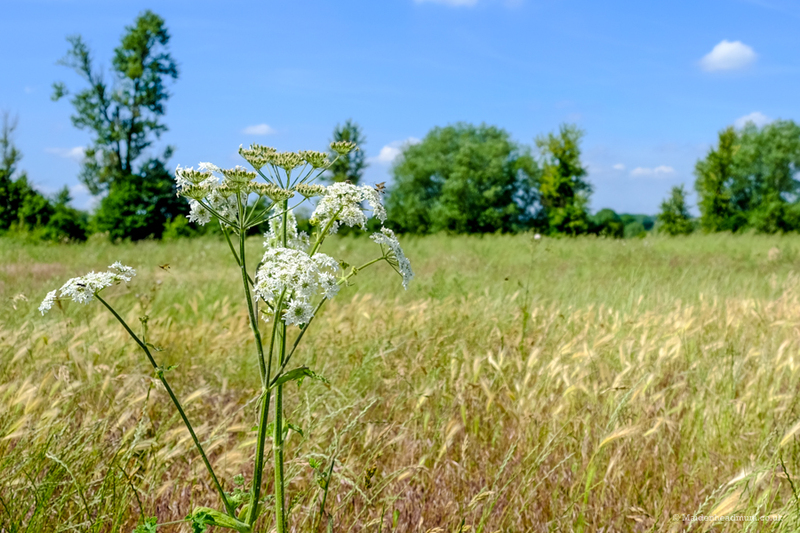 These flowers are ‘Wild Carrot’ or ‘Queen Anne’s lace. 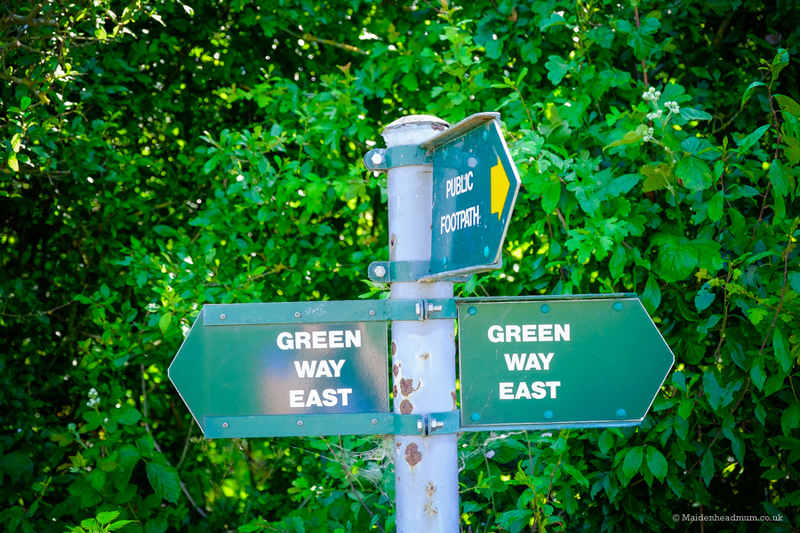 If you want to find out more, there is a really handy PDF showing the route of The Green Way which you can download from the RBWM website. 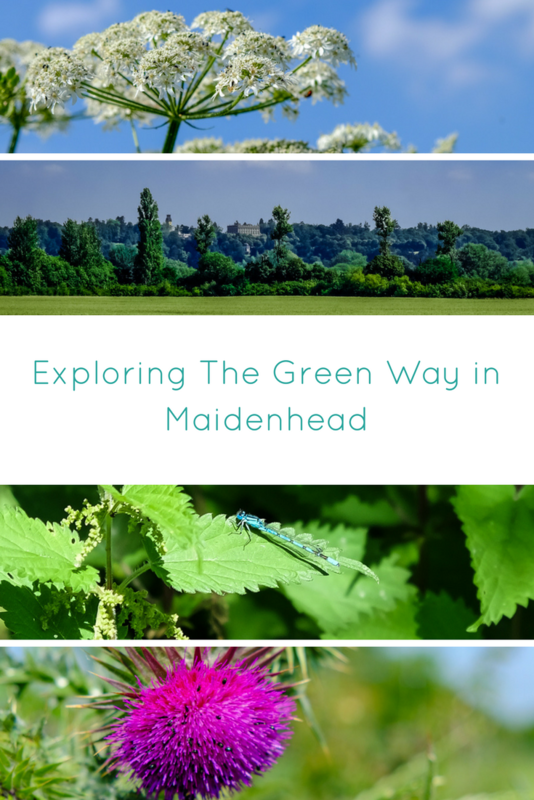 You can read more about The Green Way, including the history of it on the Maidenhead Civic Society website too. With the help of members of the ‘Eco @ Oaken’ Facebook group, I’ve been able to identify the names of the flowers that I saw. I thought it would be useful to share this on a handy sheet so that you can download it and see how many you can ‘spot’. Could be a great way to keep the younger ones entertained along the walk. I hope this helps keep the kids inspired as they explore the paths around Maidenhead. 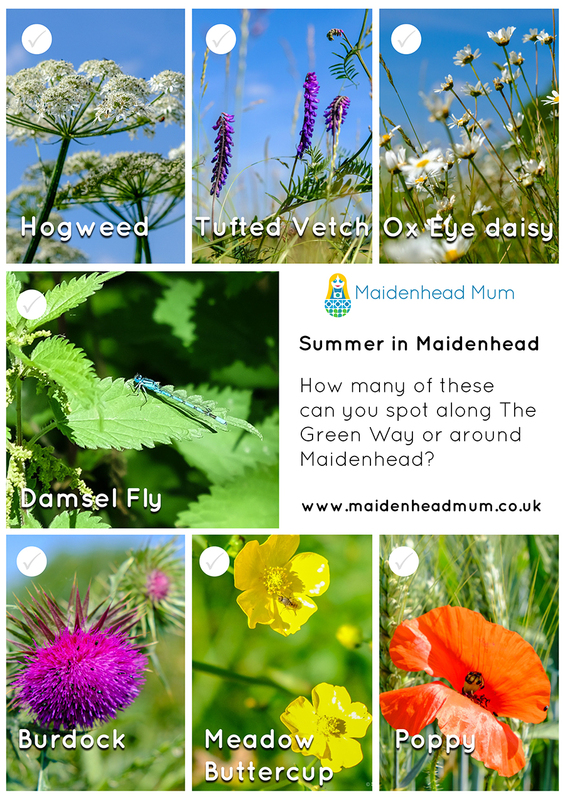 You can click the text above to download a ‘Summer in Maidenhead Spot it’ sheet. This includes the map of the whole route shown above and also details of the things you can spot along the way. Essential reading before you set off. If you want to save this post for the weekend or the summer holidays, why not add it to a Pinterest board?